The original house at Merlin Park, built by Charles Blake in the first decade of the 19th century. 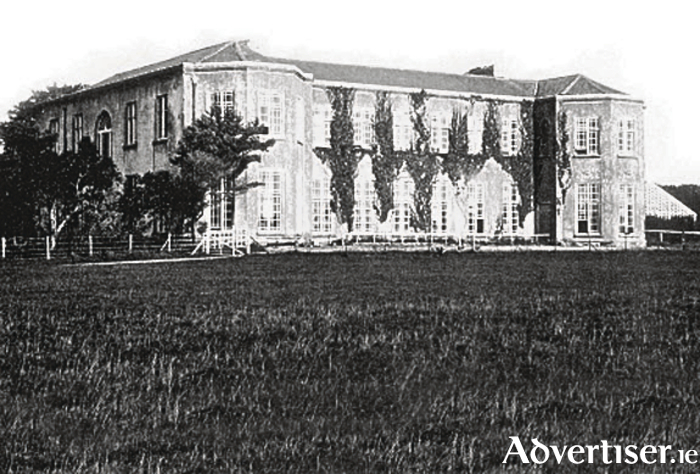 Merlin Park House was a large late Georgian pile surrounded by trees, but built on a sufficient height that it enjoyed views of Galway Bay. It was originally built in the early 19th century by the influential Blake family, who were renowned for throwing wild parties and hunting with the hounds. During one particular party the madness of it all spread even among the staff. Mary McManus, a ladies’ maid, could not resist spying on the cavorting between the butler and another maid, far below the stairwell, two storeys down. As she leaned over the bannister to get a better look, the poor girl fell to her death. Consternation broke out among the roisterers. They were so moved that they subscribed to mark the spot on the stone floor where she fell and instantly died, with an engraved flagstone: ‘Mary McManus, Virgin, 1827’. The Blakes didn’t have much luck after that. Half way through the 19th century the house was sold to a rather sombre Henry Hodgson, and was purchased from him in 1876 by Robert W Waithman, who married Arabella Persse, a sister of Lady Augusta Gregory, of Coole Park. The house was again bought by another Waithman, of Moyne Park, Ballyglunin, and his son, Capt Wyndham W Waithman, inherited the house. In 1942 Wyndham married a local girl Eileen O’Driscoll, known as Dricca. It was a marriage made in heaven. They adored each other, and loved the house and woods. While the captain was busy in his extensive workshop (making scarecrows, furniture, toys and boats ), Dricca organised the upkeep of the house. They lived very simple lives, as their income was modest. Together they gardened, harvested trees, and planted more. They were busy as the day was long, and happy in each other’s company. As a result, there were no administrative delays in proceeding with the sanatorium. It was paid for by the Sweepstakes fund, and in 1953 it was the first hospital dedicated to the relief of TB sufferers opened in Ireland. The captain and Mrs Waithman moved to Murrough House, a Victorian mansion, not too far away. It stands today among trees and woodland, on the shores of the bay, south of the railway track. It also was a Blake residence, with the enviable privilege of being able to stop the Galway to Dublin train by tying a red flag to the gate at the railway crossing. It saved an inconvenient journey to the railway station in the town. But there is no evidence that the captain and Dricca availed of this service. They resumed their simple life together. The captain sailed and fished from the boat he built, while Dricca minded the house and welcomed visitors. She often told the story of Mary McManus, and denied that she ever saw her ghost. But she had seen the dedicated flagstone. Unfortunately Dricca and her husband could see the demolition crews going about their work on Merlin Park House. They could see partially destroyed rooms and corridors which brought back memories. It distressed the captain very much. He wished it all could be finished, not to have it partially hanging between the past and the present. He died in 1975, leaving Dricca in Murrough House alone. A year later, in a moment of inspiration, she walked up to the now Merlin Park hospital, and asked to see the late, and always busy, Eamon Hannon, CEO of the old Western Health Board. She hardly dared hope for a favourable reply, but she told him she was lonely for her husband and for the woods at Merlin Park. Could she come back and live on the estate again? To his eternal credit, and without hesitation, Eamon Hannon said she would be welcome. A small woodman’s cottage was provided, cypress trees planted, and a small garden cleared for her. She had her own gate leading on to the main road. She spent her remaining years living ‘between two worlds, where she could reflect on the elegance of the great house, now no more, and recall the final years she had with her captain’. Eileen O’Driscoll, Dricca, died at Merlin Park in 1997. NOTES: I am leaning on Renmore and its Environs (published 1980s? ) by Norbert Sheerin for much of the above. I am very grateful to Sr Mary de Lourdes Fahy for information on the Waithmans. Try as I did, I could not locate a photo of the captain or of Mrs Waithman. Thanks to Dr Noel Browne, new drugs, and dedicated doctors and nurses, tuberculosis is now under control in this country. It appears to me that Merlin Park Hospital today is underused. Hildegarde Naughton TD campaigned to relocate some departments from the over crowded University College Hospital to there. Surely there is merit in her suggestion. Also, it is still very difficult, and dangerous, to exit Merlin Park in a car, and turn into the city. It has been a hazard for decades. It should not be beyond the wisdom of our planners to devise a safer exit.